We’d love your help. Let us know what’s wrong with this preview of The Dog Who Wanted to Fly by Kathy Stinson. To ask other readers questions about The Dog Who Wanted to Fly, please sign up. Cute book about trying your hardest, even when gravity and the fates are against you. Zora the dog feels that the only way she can catch that annoying squirrel is if she could fly, so she tries everything she can to do so. Tully, the cat keeps saying that dogs can’t fly, so to give it up. But Zora is anything, if not determined. And in the end, she does fly, if only for moment, if not to get the squirrel, but to save Tully. Friendship and love can overcome anything. Well, most everything. Cute pictu Cute book about trying your hardest, even when gravity and the fates are against you. Cute picture book about failing and trying again. Kids will enjoy the bright, silly pictures. Ever since reading Red is Best to my son when he was little, Kathy Stinson was a favourite author of ours. Now I am reading her books to my his children and I can't wait to get a physical copy of this book to read to them. Zora really wants to catch a squirrel but is just not fast enough. Maybe if I can fly, Zora thinks. Tully, the cat, relaxing in the tree just keeps saying, "Dogs can't fly", that is until a friend is in danger. The Dog Who Wanted to Fly is a sweet story about pursuing dreams an Ever since reading Red is Best to my son when he was little, Kathy Stinson was a favourite author of ours. Now I am reading her books to my his children and I can't wait to get a physical copy of this book to read to them. Zora really wants to catch a squirrel but is just not fast enough. Maybe if I can fly, Zora thinks. Tully, the cat, relaxing in the tree just keeps saying, "Dogs can't fly", that is until a friend is in danger. Thank you to Annick Press Ltd. and Netgalley for the opportunity to read this book in exchange for an honest review. The Dog Who Wanted to Fly by Kathy Stinson was everything I hoped it would be. As a dog mom to two golden retrievers, I instantly fell in love with Zora and her quest to learn to fly (so she could catch her pesky nemesis - the squirrel!!). My youngest golden, Atticus, is always on the lookout for squirrels so our family can definitely relate to the premise of this cute story! The Thank you to Annick Press Ltd. and Netgalley for the opportunity to read this book in exchange for an honest review. The illustrations were beautiful and perfectly fit the personality of all the characters. The story was creative and lasted just long enough to hold a child's attention. It was cute watching Zora think of ideas and try to execute learning to fly so she could catch the squirrel. I also liked that it taught a lesson that you should always keep trying and even if you don't reach the goal you first set out to achieve, you can still do something good with hard work and perseverance. Cute and funny story, kids would probably laugh a lot in this one, but the story was a bit too light for my own taste. The illustrations were beautiful in a very 3d modern style that should please the young ones. Not extraordinary, but worth it! Zora is a dog who wants to fly. She wants to fly so she can catch a squirrel, which I guess is a reasonable goal for a dog. So she tries different methods to get herself airborne. Not much works, until she's faced with actually needing to fly to help a friend. I'm not sure if the friend got into trouble on purpose, just to motivate Zora to do what she did (the nature of the creature in question makes me wonder). The outcome is a little abrupt, and at first I was a little surprised that the book h Zora is a dog who wants to fly. She wants to fly so she can catch a squirrel, which I guess is a reasonable goal for a dog. So she tries different methods to get herself airborne. Not much works, until she's faced with actually needing to fly to help a friend. I'm not sure if the friend got into trouble on purpose, just to motivate Zora to do what she did (the nature of the creature in question makes me wonder). The outcome is a little abrupt, and at first I was a little surprised that the book had ended. Once the squirrel realizes Zora can "fly" and potentially reach it, it goes quiet, stopping its continual "chitterchitterchitter" that it did throughout the story. Overall, it's a cute story about perseverance. And perhaps a cautionary tale for squirrels. Now, Zora is determined to show them, yes she CAN fly! But it’s not until Tully The relationship between neighborhood animals can be so entertaining. My guess is Stinson has been inspired by her share of silly behavior out her back door! As an animal lover, it’s hard not to love this adorable story! Thank you to Annick Press and NetGalley for this adorable picture book! This will be featured on my blog December 5, 2018. I love this book, especially the illustrations. Zora, a loveable dog, has personality plus. She is quite a character. Her dream is to fly so she can catch the pesky squirrel that keeps taunting her in her backyard. The squirrel knows just how to press Zora's buttons and Zora wants to rise to the occasion (literally) to teach that scallywag a lesson. Tully, a skeptical cat, discourages Zora and tells her that there is no way that dogs can possibly fly. Zora tries hard to prove Tully wrong. She fl I love this book, especially the illustrations. Zora, a loveable dog, has personality plus. She is quite a character. Her dream is to fly so she can catch the pesky squirrel that keeps taunting her in her backyard. The squirrel knows just how to press Zora's buttons and Zora wants to rise to the occasion (literally) to teach that scallywag a lesson. Tully, a skeptical cat, discourages Zora and tells her that there is no way that dogs can possibly fly. Zora tries hard to prove Tully wrong. She flaps her ears and wiggles her tail... no... fail. She tries to obtain liftoff by pouncing on an empty teeter-totter... nope, and then she grabs an umbrella and tries to soar through the sky like the kite she sees high up in the heavens... oh nooo... human intervention. She spots a huge heavy airplane zooming along with ease and lays on her stomach, stretches out her legs and whispers, "Up! Up! Up!".... uh uh. She's doomed to remain earth-bound. Totally discouraged in her defeats she trudges back to her doghouse downhearted and sad. Is there any hope that her dream of flying can come true? Zora picks up her ears when she hears a desperate cry for help from Tully who is stranded high up in a tree. Instantly "Zora's everything tingled! " Another cry calls her into action and Zora is off to the rescue but can she take flight to do so? This delightful story of perseverance and heart is embedded in almost animated illustrations of the highest quality. They are expressive and full of action visually encouraging the reader to never give up dreaming. My all time favourite is when Zora is sprawled out under the shadow of a huge airplane which is flying overhead and she is trying to levitate. I highly recommend this book with it's positive message and pleasing humour. Dream on and dream BIG! I'm not really sure how to review this book, since I think there was something wrong with my review copy. The words didn't match the illustrations, and for most of the book I thought Tully was the squirrel instead of the cat. It makes sense now that I've read it (and reading the synopsis beforehand would hav I received an ARC from NetGalley in exchange for an honest review. My thoughts and opinions are my own. Any quotes I use are from an unpublished copy and may not reflect the finished product. I'm not really sure how to review this book, since I think there was something wrong with my review copy. The words didn't match the illustrations, and for most of the book I thought Tully was the squirrel instead of the cat. It makes sense now that I've read it (and reading the synopsis beforehand would have helped, too), but I was very confused for awhile. After re-reading the story with my new knowledge, it read a little better, but the formatting was still slightly off. Speaking of illustrations, they were wonderful! I think they really complimented the story. However, I do not think this is a book I'll be reading again in the future, although I would be interested in seeing how a finished copy compared to my review copy. It has a good message about not giving up, but I felt like there was something missing from the overall story. Zora wants to fly, mostly to get after the squirrel that is always making fun of her. Her cat friend Tully doesn’t think that dogs can fly. Zora looks at the flying things in the world around her for inspiration and keeps trying. When Tully the cat needs her help, can Zora find the confidence to fly? This is a cute story, but I couldn’t help but think of ‘Today I will Fly’ by Mo Willems the entire time, and comparing them, Mo Willems winning out completely. The artwork is really dated looking and unappealing, with a shadowed cast in almost all of the images. The Dog Who Wanted To Fly' by Kathy Stinson with illustrations by Brandon James Scott is about a dog with aspirations of flight. Zora the dog wants to catch a squirrel, but in order to do that, Zora will need to learn to fly. As hard as Zora tries, she can't, and skeptical cat Tully is there to see her failures. It seems that Zora will never fly until one day she gets the right motivation. The squirrel should be scared now. 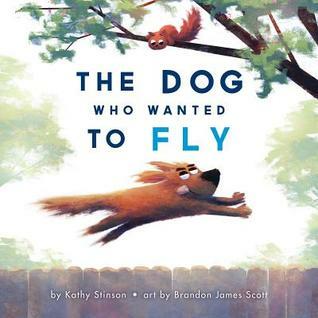 I love this story of not giving up, even when some cynic is telling you th The Dog Who Wanted To Fly' by Kathy Stinson with illustrations by Brandon James Scott is about a dog with aspirations of flight. I love this story of not giving up, even when some cynic is telling you that you can't. I love the really cute illustrations in this book too. I think younger readers will get a kick out of it. The expressive illustrations often say as much as the text. Kids will laugh out loud at the humorous story and lively pictures. I know it’s only February, b Zora wants to fly. She needs to fly. She wants to prove Tully the cat wrong and get to that chittering squirrel on the fence. Despite Zora’s best efforts, she just can’t figure it out. Flapping her ears and wagging her tail? Launching off a teeter-totter? Nothing seems to work… until Tully needs help and Zora springs into action – and flight. This book was received as an ARC from Annick Press in exchange for an honest review. Opinions and thoughts expressed in this review are completely my own. I was so fascinated by the pictures of this book. The images were so beautifully drawn and painted that it brought the story of Zora to life and achieving her dream to fly. This book will be amazing for the children and is the perfect book for a storytime or a Toddler Activity Time! The characters are just so original and witty that it made the This book was received as an ARC from Annick Press in exchange for an honest review. Opinions and thoughts expressed in this review are completely my own. I was so fascinated by the pictures of this book. The images were so beautifully drawn and painted that it brought the story of Zora to life and achieving her dream to fly. This book will be amazing for the children and is the perfect book for a storytime or a Toddler Activity Time! The characters are just so original and witty that it made the story even more enjoyable. Zora (the dog) dreams of flying, initially in order to catch the annoying chittering squirrel. Through a variety of techniques, trial and error, and ambitious efforts, Zora is about to give up when an endangered friend needs her help. Her "everything" sparks a super effort and she comes to the rescue, nearly flying to do so. And that is enough. There are loads of smile-inducing moments, pages of prediction prompting page turns, and empathetic opportunities in this book to make it a read-it-again Zora (the dog) dreams of flying, initially in order to catch the annoying chittering squirrel. Through a variety of techniques, trial and error, and ambitious efforts, Zora is about to give up when an endangered friend needs her help. Her "everything" sparks a super effort and she comes to the rescue, nearly flying to do so. And that is enough. I received a digital ARC from Netgalley to review. Short, sweet picture book about a dog who wants to fly and doesn’t give up on his goals to do so. The story seemed like it wasn’t fully developed and could have been expanded upon some. The illustrations are fantastic. Fun book for the early grades. Such a cute story about trying your best always. You never know what you are capable of when you need to do something so never give up. Loved the illustration. one I would share with my own granddaughter. Fun picture book for the 2 to 7 year old dog lover. The cheerful and detailed artwork adds action and movement to the text and provides more conversation-starting material for teachers and care-givers. Solid purchase for libraries. Thanks for the dARC, NetGalley. So cute! The ending seemed abrupt, but it may be the e-ARC I have. Very young, repetitious, about a dog who wants to fly. He keeps trying. And then 😍 Thanks to Netgalley for the e-ARC. Thank you Netgalley for the advance copy of this book. Cute illustrations. I felt the story to be super simplistic and bit lackluster. Would have liked a bit mode substance. Cute story, adorable illustrations and great last page. very cute and i feel like if my dog could talk, she would relate. ARC Copy...expressive and almost impression in style-touch illustrations coupled with the warm yet funny narrative of a dog who never give up on her attempts/dreams to fly. The Dog Who Wanted to Fly by Kathy Stinson is an entertaining and funny book about never giving up. Which is beautifully illustrated to enhance the story line. Zora believes she can learn to fly, a freedom she has never experienced. Read the book to enjoy this wonderful story. I found this book very sweet, but felt the ending came up short. It almost felt like there should have been another page before the last in order for the story and illustrations to flow better. Regardless, the artwork is adorable and perfect for the story. Author and illustrator are well-matched. Both are award-winners. I think any child will fall in love with the dog, Zora and her desire to fly to catch a squirrel and prove that pessimistic cats drool. How many times have we all wished we could fly? Sweet little book about an "underdog" who achieves success. Kids will love this sweet book. Kathy Stinson, author of internationally acclaimed Canadian children's classic, Red is Best and the TD Award Winner, The Man with the Violin, also writes novels, short stories, and nonfiction for young people of all ages.